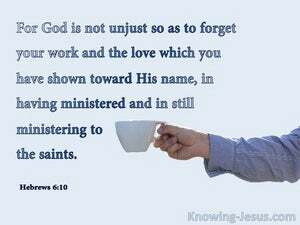 ﻿ Hebrews 6:10 For God is not unjust, to forget your work, and the love which you showed for his name, having served the saints and [still] serving them. And whoever shall give one of these little ones a cup of cold water only, in the name of a disciple, I tell you truly, he shall by no means lose his reward. and whoever gives you a cup of water because you are Christ's, truly he shall not lose his reward. And looking steadily at him and being afraid, he said, What is wanted, Lord? And he said to him, Your prayers and charities have come up as a memorial before God. I tell you most truly, He that receives one that I send receives me; and he that receives me receives him that sent me. And there was at Joppa a certain female disciple called Tabitha, which being interpreted is called, Dorcas; she was full of good works and charities which she bestowed. and said, Cornelius, your prayer is heard and your charities are remembered before God. By no means; but let God be true, and every man a liar; as it is written, That thou mayest be justified in thy sayings and overcome when thou art judged. 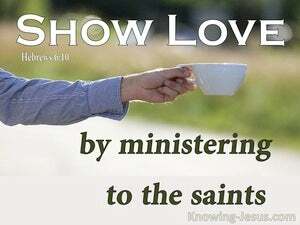 contribute to the necessity of saints, practise hospitality. But now I am going to Jerusalem to serve the saints. CONCERNING the collection for the saints, as I directed the churches of Galatia, so also do you. that you may be enriched in every thing for all liberality, which produces through us thanksgiving to God. For in Christ Jesus neither circumcision avails any thing nor uncircumcision, but faith which works by love. For you are called to liberty, brothers, only make not your liberty an occasion for the flesh, but by love serve one another. As we have opportunity, therefore, let us do good to all, but especially to the members of the family of the faith. for even in Thessalonica and once and again you sent to my need. and whatever you do in word or in work, do all in the name of the Lord Jesus, giving thanks to the God [and] Father through him. but being at Rome he sought most diligently, and found me. henceforth there is laid up for me the crown of righteousness, which the Lord, the righteous Judge will give me in that day, and not me only but all who love his appearing. And forget not beneficence and liberality; for with such sacrifices God is well pleased. We know that we have passed from death to life, because we love the brothers; he that loves not, continues in death.